Wallich Residence – the residential component of the Tanjong Pagar Centre – a landmark integrated development which sits right above Tanjong Pagar MRT at Peck Seah Street/Choon Guan Street. Wallich Residence units will start at 180m above sea level, peaking at 290m, the highest residences in Singapore when completed in 2019 (expected). The 181 units of very exclusive and prestigious sky homes will offer unobstructed, panoramic views of the city. The units will be oriented in the North-South direction, minimizing solar heat gain and optimizing shade. At the very top will be a 3-storey super penthouse, with sweeping views to the north, east, and south of Singapore. Residents at Wallich Residence will enjoy the benefit of 2 facilities levels that will include a pool deck, 50 meter lap pool, sky gym, function rooms and BBQ area on Level 39. The second facilities level on Level 52 will include a dining lounge, wine room, business centre and mini- theatre. The centrepiece of Tanjong Pagar Centre will be a re-imagined Tanjong Pagar Park and a City Room, which will create unique public spaces that provide activity and open space to visitors. The City Room will include public art and outdoor performance areas, thus creating a vibrant public environment and extending the activity hours of the Tanjong Pagar Park well beyond business hours and provide weekend attractions. The units will comprise 1 to 4 bedrooms, junior penthouses and a super-penthouse located right at the top of the tower. Industry sources view this development as a way for Tanjong Pagar to regain some of its lustre which has been affected by nearby Marina Bay. The proposed integrated development at Tanjong Pagar, a prime location within the Central Business District, is set to be a world-class icon that will redefine the Singapore skyline. Located above the Tanjong Pagar MRT station, the 1.7 million square feet development will feature premier Grade A office and retail space, an international hotel and exclusive residential apartments. Upon completion, the iconic integrated development will stand at a height of 290 metres and be amongst the tallest buildings in Singapore with panoramic views of the city skyline and across the CBD to the Marina Bay area. World-renowned architects Skidmore, Owings & Merrill (“SOM”) and Architect 6 will design the project, which currently does not have a name. SOM’s impressive portfolio of works include the world’s tallest building, Burj Khalifa in Dubai and the upcoming One World Trade Center in New York. Tanjong Pagar Centre consist of Guoco Tower – a 38-storey Grade A office block, with six levels of retail and food and beverage (F&B) space, as well as a luxury business hotel. The office is of 38 storeys and have 850,000 sqft of net lettable space. The office space will feature large floor plate and column-free spaces of between 25,000 and 29,000 sqft. 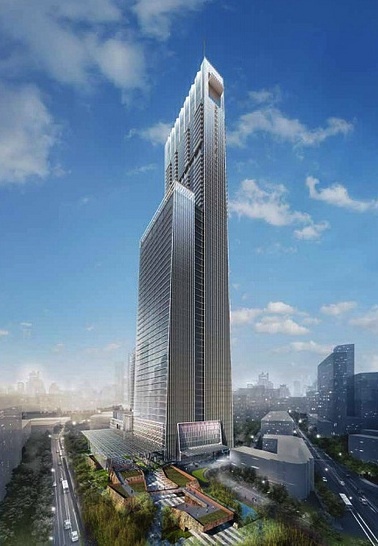 The luxury business hotel is expected to house more than 200 rooms good for travelling business and is linked to the main tower. There will be direct access to the Tanjong Pagar MRT station. Sofitel Singapore City Centre is situated in the country’s latest landmark development, which will include Singapore’s tallest building, standing at 290m. Located in the Central Business District, the hotel will sit above the Tanjong Pagar MRT station, and is part of a large-scale integrated development designed by Skidmore Owings & Merrill. The hotel is an emblem of Singapore’s global confidence as a cultural and trading centre. It attracts world leaders and business travellers to this dynamic district with its contemporary design and cutting-edge business technology. Sofitel Singapore City Centre is situated in Singapore’s dynamic Central Business District, one of the city’s most fashionable addresses with excellent transport connections. Sofitel Singapore City Centre’s proximity to Tras Street, the Maxwell Food Centre and the Telok Ayer Performing Arts Centre, makes it a cultural destination in its own right.